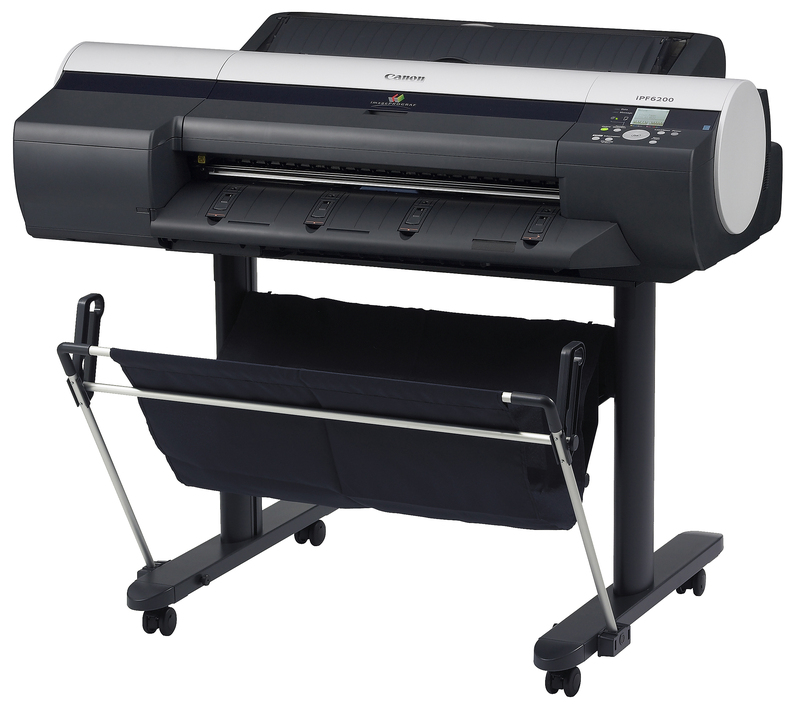 Canon's imagePROGRAF iPF6200 is a full-color, large-format document printer designed for graphics professionals who need to regularly produce large documents with extremely accurate color reproduction and print longevity. The printer measures 39" by 46.4" by 34.3" and weighs approximately 145.5 lbs with its included stand, which is virtually necessary given that placing the printer on other furniture could easily block or make difficult to use its feeds, especially when processing large rolls of paper. The printer produces documents at a maximum resolution of 2400 by 1200 dpi and includes 30720 nozzles through which to deliver ink, split up between 2560 nozzles for each of its twelve colors (cyan, photo cyan, magenta, photo magenta, yellow, black, matte black, red, green, blue, gray, photo gray). To ensure print quality even in the event of one nozzle failing, the printer includes detection and compensation for non-firing nozzles. It produces ink droplets as small as 4 picoliters. The printer can print to media at widths between 8" and 24" in width and documents as long as 62' through its top loader and 36' through its front loader, as well as rolls with a maximum diameter of 5.9". The top loading paper feed can process documents at thicknesses between .07 and .8mm, while the front loading manual feed can process documents between .5 and 1.5 mm in thickness. Rolls can be between .07 and .8 mm thick. The printer can print to borderless documents on roll paper as wide as 10", B4, A3+, 14", 16", A2, A2+/17", B2, A1, or 24", and to satin photographic paper, glossy photographic paper, graphic matte canvas, heavyweight satin photographic paper, and heavyweight glossy photographic paper. The printer can interface with devices via USB 2.0 or 10/100 Base-TX Ethernet, making the printer easily networked in environments that need it. IEEE 1394 Firewire ports are available as an optional add-on if needed. The printer includes 384MB of RAM, which is not listed as being expandable. An 80GB hard drive is built into the printer, which provides data storage, reduces load on PCs, and increases speeds. The printer produces 49 dB of noise when operating, consumes 5W of power in standby and 100W of power at maximum operation. The printer also processes documents using GARO, Canon's proprietary printing language, but does include plugins to work in Adobe Photoshop and Digital Photo Professional for Windows. Windows operating systems from 2000 onward are supported, as is Mac OS X. Unlike comparable printers from Epson and other manufacturers, the printer can automatically switch between matte black and photo black inks when necessary without necessitating that users manually swap the cartridges depending on the kind of job being sent to the printer. The printer includes EFI Colorproof eXpress RIP, an Adobe PostScript-based proofing program to make color handling, definition, and presets easy to manage either on-site or remotely. Though the printer does include support for Mac OS X, users of PostScript applications such as QuarkXPress or Adobe Illustrator will need to use a RIP package compatible with Canon's proprietary GARO printing language, as it does not include PostScript support. 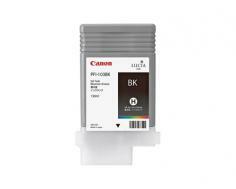 This will add some downtime and potential additional costs to the process of using this printer for Mac OS users. A USB cable is not included with the printer, making it necessary to have an unused one or to purchase one before the printer can be set up after unboxing. While this isn't a long-term drawback, it is an inconvenience and something worth noting for prospective buyers. The printer does not offer any letter or standard-sized paper tray, meaning that environments that do perform occasional non-graphics jobs of more than a few sheets will need another printer in order to complete them, as all paper will need to be fed manually. 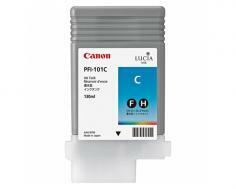 Review it: "Canon imagePROGRAF iPF6200 "
Ink is available in 130 ml cartridges for all 12 colors that the printer uses. Unlike office printers or consumer inkjets, ink for printers like the iPF5100 is measured in milliliters, rather than pages out, given that the amount of ink consumes varies drastically from job to job based on the quality of prints and the color composition of the images being printed. Over time, the printer's print heads and maintenance cartridge will also require replacement to prevent ink clogs and to dispose of waste toner, which can overfill over time.